Sometimes, our work requires us to use different operating systems. And buying a separate machine for each OS that we need is simply not the best solution. 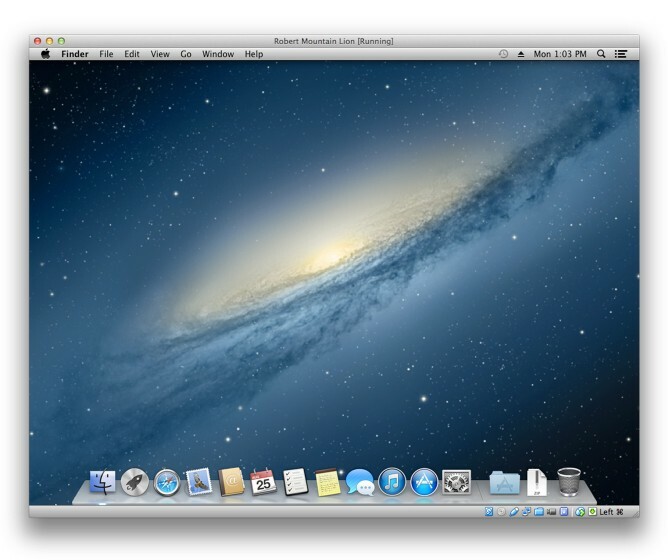 This article provides step by step guide on installing OS X Lion or OS X Mountain Lion on VirtualBox as guest OS. I am talking about running these OS legally, not about Hackintosh. So the host machine MUST be OS X since it’s the only way to run legal OS X.
I have used these steps to install OS X Mountain Lion (as guest) in my Mac mini running OS X Mavericks (as host). The VirtualBox version that I use is 4.3.6. As a bonus, I will add guides to install OS X Mavericks as guest OS too, but I haven’t tested running Mavericks as guest OS. Disclaimer: This guide is provided as is, without any guarantee. Use this guide at your own risk. First, I assume you already know about VirtualBox. It’s one of the best virtualization software from Oracle, and it’s legally free. If you haven’t heard about VirtualBox, you can start from here. After you have VirtualBox installed. The next step is to create a new virtual machine. Follow the on screen instructions. Nothing special here. As a little tip, I use 20 GB virtual storage for Mountain Lion installation, but of course this will depend on what you are planning to do with the guest OS. When you’re done with creating the virtual machine, do NOT run the machine yet. Go to the machine’s setting and choose System tab, find the setting for Chipset and make sure PIIX3 is selected there. Next, make sure EFI is enabled. OS X Lion, Mountain Lion and Mavericks are downloadable from Mac App Store. Download the installation file of the OS that you need. It’s a big download (over 4 GB) so it will take a while. When the installation file is downloaded, it will ask you to proceed with installation, do NOT proceed. Instead, simply close the dialog. After downloading installation file, we need to create bootable image for VirtualBox. There are various ways to create this, but I’m going to use a tool called iESD that I got from here. Credits to Edward Shaw for creating this excellent tool. Type gem install iesd to install iESD. If it doesn’t work, add sudo. Next, if you want to install Lion or Mountain Lion, download this file and extract it to your user folder. For Mavericks, you do not need to download this file. Again, if the command didn’t work the first time, try using sudo. You should have a dmg file for installing your guest OS now. Find it in your user folder. Now go back to VirtualBox and run the virtual machine. It will ask for startup file, point it to the dmg file you just created using iESD. The actual trick here is creating the correct dmg file that will not cause kernel panic. I tried other methods of creating this bootable installer drive from other guide and ended up with AppleIntelCpuPowerManagementClient error upon booting my virtual machine. This new dmg file created using iESD solves the issue. That’s it ! The following process is the usual steps of installing OS X.
Edit 27 Mar 2014 : This guide should work with VirtualBox 4.3.6 and 4.3.10. There is a report that it doesn’t work with VirtualBox 4.3.8 (thanks to papaiso and edsko). As mdl says although you can just format the disk in the Disk Utility from the Utilities Menu with no restart required. Managed to get Yosemite running on Mavericks but by crikey it was painful. The installer said “17 minutes to go” – took 3 hours. Late 2012 Mac Mini with 4GB (now needing a substantial upgrade). Please forgive me but I just jumped in to try the thing out on my own, without all the excellent directions you provide.. I installed 10.6 from a standard installer disk on a machine running 10.7. I also used disk utility to create a single named partiton on the virtual disk and the installation went fine. Problem is after the usual reboot, that screen comes up asking to identify the keyhboard by pressing a specific key. It can’t. It just keeps pinwheeling. Aparently the simulation doesn’t see the keyboard. What can I do to fix this? Unfortunately it is not working for Mavericks 10.9.5 on VBox 4.3.18. The boot gets to “hfs: mounted OS X Base System on device root_device” and halts. No error, but it sticks there forever. Awesome instructions. Just out of curiosity, does audio in “Intel HD Audio” mode work in the VM? I followed the instructions in an attempt to install Mavericks as a guest on my Mavericks host OS. I mistakenly started executing the last terminal command, for ECC memory. I realized that I was doing this and killed the command. I tried the ECC memory terminal command again, but the same message appears. Now I regret cutting the execution of that first command. What do I do to rectify this? After running iesd to get the new dmg, the installer was not booting till I updated the cpuidset. All instructions worked fine above. Once loaded follow mdl’s fix for showing up the disk by erasing. I didnt have to restart for it to show though. Verified this on a mac book air and pro. Using iESD is very (very, very) frustrating. It requires ruby 1.9.2. And getting ruby 1.9.2 installed on Mountain Lion must be the hardest thing to do on a computer nowadays. No matter if I used a superuser account, done everything via sudo, etc, first of all rvm failed no matter how hard I tried it to work. Then I tried some GUI called jewelry or something, and it also failed with an error (a Mac GUI failing with an error, this is the first time I see this in maybe a decade). Yes, I’ve Xcode command line tools installed, and all requisites installed. But ruby isn’t Mac-friendly. I’m sorry, I’ll try another approach. Very frustrating. 3. You may need to adjust your $PATH to ensure that the Homebrew-installed Ruby takes precedence over the system-installed one; placing this in your .bash_profile will do the trick: export PATH="/usr/local/bin:$PATH"
Many thanks. Worked a treat for Mountain Lion on Mavericks. Running from OS X 10.9.3, trying to make Mountain Lion install. It seems the iesd gem has a new syntax for pointing out kexts: –install-kext is now –install-extension, apparently. I managed to get this working well running Mountain Lion inside Mavericks. Then goes to the “Loading kernel cache” stage, and finally ends up at the efiboot shell prompt. Thx for the great tutorial. Used this to install Mavericks on VB 4.3.10. On boot, the OSX installer got stuck on “hfs mounted on device root_device”. Following up to my own comment, you have to run the command from the same account as created the VM’s. I had run it as sudo. It works if you run it normally. Got Mavericks on VB 4.3.8 installed and working but how do you install the guessAdditions? Until today, there is no Guest Additions for OS X clients. Sorry to be answering my own question, but this appears to be a regression in VirtualBox 4.3.8 (see also https://github.com/boot2docker/boot2docker/issues/260). Upgrading to 4.3.10 (just released) seems to fix the issue. Thanks for sharing your experience. So I take it as you have Lion installed in 4.3.10 now? Mountain Lion actually, but yes. (“Mac\ ” missing). Unfortunately, however, it’s not working for me :( Host OS is Mavericks, on a mac mini, VirtualBox 4.3.8 with extension pack installed. Created the virtual machine as per instructions (PIIX chipset or nothing will happen, EFI or it won’t find the boot medium). Created the .dmg as instructed, tried with both Lion and Mountain Lion. But sadly both fail with a kernel panic, almost immediately. 1. Have you downloaded iESD? 2. Have you downloaded OS X Lion from Mac App Store and make sure the installer file is still in your Applications folder? I wonder if I should try an older version of iesd?! Thanks for updating your progress. I have tried my syntax with Mountain Lion and there was no problem. Not sure why OS X Lion would require different syntax. The one I personally installed was Mountain Lion (guest) on Mavericks (host) and it worked well. With the dmg files created following the instructions on this post I was able to install Lion and Mavericks on VB 4.3.8 on Mavericks, but not on Ubuntu 12.04. When I get to the screen that asks me which hard drive to install on, the list is empty. Have you run into that? There should be a button next to the empty list so we can choose our freshly-made dmg file. I was able to solve this is my own. In the VM, I chose Disk Utility from OS X Utilities and erased the drive. Then I restarted and the disk showed up as an option to install to.